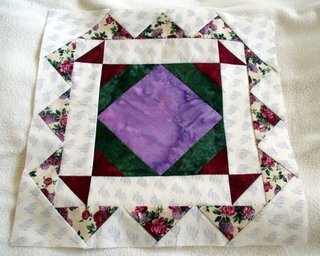 Last month, I paid $10 to my local quilt shop, and was given the fabric and instructions to make two 12" quilt blocks. As long as I complete each month's blocks, I get the next month's for free. So, an entire queen- sized quilt top for $10 (plus you have to provide some fabric for background and setting triangles). But that's not the important part, the main thing is that I get to have some time to myself once a month. It's just 90 minutes, including driving back and forth, but heck! I'll take it. 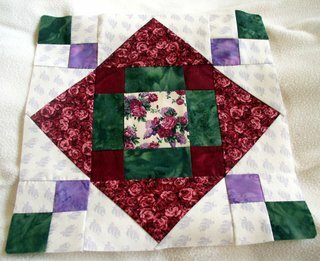 In fact, I hadn't even seen what the quilt was going to look like, or what fabrics were being used, and I signed up. I didn't care if it was hideous, flourescent orange or grey (no offense to flourescent orange or grey lovers out there), I get to do something I love and get away from everyone in my family for one guaranteed moment every month. I can't contain my excitement! While they aren't fabrics I would immediately be drawn to, I do like the way the blocks look. Maybe I'll end up giving away the final product, because I think it's a bit too feminine for my husband's taste, and a bit too traditional for mine, but like I said, I really don't care. I'm just in it for the relaxation. I'm handpiecing all of these, as I almost always do, and I find that the most time consuming part is drawing all the quarter inch seam lines on the backs of the individual pieces. I think at this point, I could probably eyeball it all and still maintain a pretty consistent seam allowance, but I guess I don't trust myself and still find myself using a little ruler, my sandpaper board (just fine grit sandpaper and a clipboard) and fine line mechanical pencil. Haven't even started on the blocks that are due April 7, but, whatever. That's eons away, isn't it? Its wonderful that you're carving out some time for yourself. Your blocks are lovely. Your blocks look so nice and I'm impressed that you are handpiecing them! The blocks are looking great! And I agree, it's so important to have some time to yourself. It's a bonus that you get to do something that you love during that time and you're also sharpening/learning your skills.